There have been millions of workers who have been laid off in the past few years, who are now living in straightened circumstances, not because of poor performance on their part, but rather because of the poor performance of the market system. Indeed, one reads in Gibson’s article, “‘It’s less and less uncommon,’ says Kathy Donahue, Catholic Charities’ director of programs, ‘to find working people among those in line for a hot meal.’” The basic problem is that the system of economics that informs the thinking of many economists tends to maximize the wealth of a relatively small number of people, without imposing the constraint of requiring the simultaneous well-being of the average citizen, including a substantial reduction and eventual elimination of those below the poverty level, as well as a significant reduction of those in prison. This social constraint is what government is intended to bring about, i.e., “to provide for the general welfare,” as stated in the Preamble to the Constitution. Not placing sufficient emphasis on this fundamental injunction is the basic flaw in the Chicago School of Economics and our present system of capitalism more generally. Unless one admits this and redesigns one’s approach to economics, this tragic situation will reoccur over and over again, eventually, alas, bringing down our nation. This entry was posted in Uncategorized and tagged economics on December 29, 2009 by Ted Kavadas. This entry was posted in Sustainable Prosperity, Uncategorized and tagged Larry Summers, Sustainable Prosperity on December 29, 2009 by Ted Kavadas. Basically the government announced plans to cover an unlimited amount of losses at both companies. It is yet another testament to the extent of intervention in the real estate markets. This entry was posted in Intervention, Real Estate and tagged Fannie Mae, Freddie Mac on December 28, 2009 by Ted Kavadas. Below is an article from The Detroit News of December 16 titled “Nearly half of Detroit’s workers are unemployed”. Among other things, Detroit’s economic situation seems to refute the theory, with which I vehemently disagree, that we as a nation do not “need” manufacturing in order to be successful. This entry was posted in Unemployment and tagged Detroit, Unemployment on December 23, 2009 by Ted Kavadas. As I, as well as others, have been frequently mentioning bubbles, I thought it would be interesting to post a few comments (excerpts) that Larry Summers made concerning their effects during his March 13, 2009 speech. I found these comments to be very interesting, especially in light of our current economic condition and prospects for Sustainable Prosperity. “We have seen housing prices reach unsustainably high levels and credit spreads reach unsustainably low levels in the middle of this decade. And we saw bubbles in technology in the late 1990s. This entry was posted in Bubbles (Asset), Sustainable Prosperity and tagged asset bubbles, Larry Summers, Sustainable Prosperity on December 23, 2009 by Ted Kavadas. 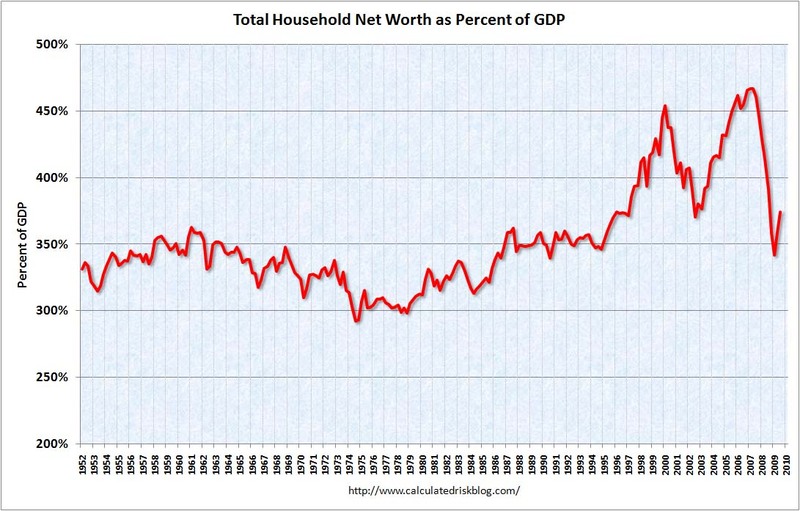 and depicts Total Household Net Worth as a Percent of GDP. The underlying data is from the Federal Reserve Flow of Funds 3Q 2009 report. I am posting it here for reference purposes, and I might comment upon it in the future. I find it to be a very interesting chart. This entry was posted in Uncategorized and tagged household net worth on December 22, 2009 by Ted Kavadas. I find Stiglitz’s view significant because it is in marked contrast to that of the 2010 economic consensus among mainstream economists. This entry was posted in Economic Forecasts and tagged Economic Forecasts, Joseph Stiglitz on December 22, 2009 by Ted Kavadas. Recently, both President Obama and Treasury Secretary Geithner have bemoaned the banker pay issue. What I find notable about President Obama’s and Treasury Secretary Geithner’s utterances on the subject is that of all the people that could potentially change the situation regarding banker pay, these two are probably most foremost. For them to simply bemoan the situation, when they are the most empowered to act upon rectifying it, seems odd. This entry was posted in Uncategorized and tagged banker pay on December 21, 2009 by Ted Kavadas. The term “Too Big To Fail” is heard frequently. However, for all of the talk regarding its danger, very little if anything has been done to rectify the condition. “Too Big To Fail” has many adverse consequences. Perhaps the most serious is that it potentially fuels moral hazard. This entry was posted in Moral Hazard and tagged "Too Big To Fail", Moral Hazard on December 21, 2009 by Ted Kavadas.